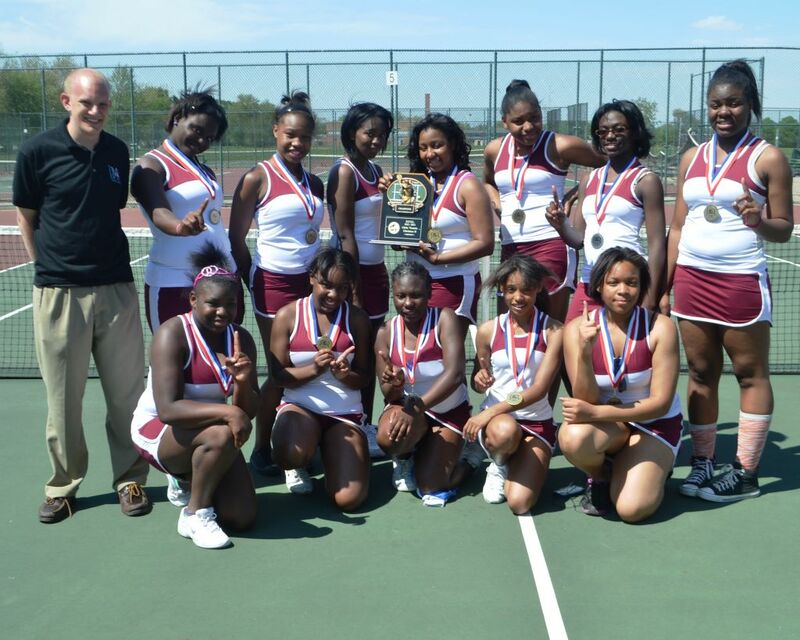 Mumford High took home four gold medals and two silvers to win the 2013 Detroit Public School League Division 2 girls’ tennis title Wednesday at Barcus Tennis Center. Coach Scott Yanak’s Lady Mustangs scored 17 points to lead the field. CMA, in its first year of girls’ tennis competition, placed second with 12 points followed by Northwestern 7, DIA 4 and Cody 0. Mumford senior Aaliyah Sadler took the gold at No. 1 singles with a 6-4, 6-1 victory against CMA junior April Smith. Mumford junior Tracey Jones defeated CMA sophomore Divine Gunn 6-4, 6-4 at No. 2 singles. The other singles’ champs were CMA junior Deija Morton, who won by default against DIA junior Breona Mueller at No. 3, and CMA senior Sarah Spears, who came from behind to defeat Mumford senior Rebekah Hunter 2-6, 6-4, 6-4, at No. 4. The doubles’ champs were Mumford freshmen Janette Taylor and Mejestix Gabert, who defeated CMA freshmen Erika Davis and Jakara Steward 6-3, 6-0 at No 1; Northwestern seniors Dyona Frederick and Destiny Williams, who beat Mumford freshmen Jada Riggs and Antonesha Chambers 6-0, 6-0 at No. 2; Mumford freshmen Briana Brooks and Ajanae Smith, 6-7, 6-1, 6-4 winners against Northwestern senior Lamonica Hubbard and junior Kenya Edwards at No. 3; and Northwestern juniors Glory Tremble and Alexus Holloway, who defeated Mumford freshmen Gevena Freeman and Alexis Christmas 7-5, 6-0 at No. 4.